I was a catalyst for change in my small rural community of St. George, an experience that has been both exhilarating and frustrating. While my efforts yielded amazing results, it’s the ups and downs of the journey that I cherish most. This two-year project stimulated residents from all corners of our town to focus on the same goal of bringing tennis to the children of St. George. While the dream began with me, I would never have succeeded were it not for the overwhelming support of the community. Early on, there was nothing tangible for them to hold onto except the passion of an eccentric retiree who had recently relocated from New York with her husband to build their dream home in the beautiful lowcountry of South Carolina. 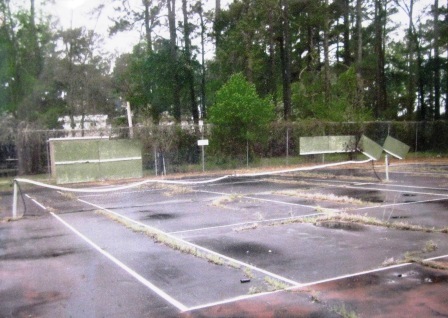 While driving along Park Street several years ago, I noticed that the tennis courts across from St George Middle School were in terrible disrepair. They didn’t look like they had been used in a long time. Why hadn’t they been maintained? Who was responsible for the courts and how could I contact them? This was in 2008 and was the beginning of my quest for information. To my dismay, I received very little positive information. There seemed to be very little concern about the condition of these derelict courts. I personally wanted to play tennis closer to home because at that time I was traveling to The Charleston Tennis Center to play. But more importantly, why were the middle school children not being given the opportunity to learn and play tennis on courts right across the street? I remembered how much my son enjoyed playing tennis when he was in middle school. This life-long sport has served him well. It helped to enhance his character through building discipline, confidence and independent thinking. Surely I knew that I had to introduce tennis to these young minds. I knew I had to do something to change the current state of apathy regarding the courts. I remembered that back in New York, Mayor David Dinkins, a tennis enthusiast, had supported the idea of building the Arthur Ashe Stadium and expanding it into the Billie Jean King Tennis Center. Using Mayor Dinkins as a role model, I called for an appointment with our Mayor, Anne Johnston. She received me graciously and I began to explain the project I had in mind and requested her advice and assistance. She suggested that I closely examine the area with the Town Park Supervisor and Councilwoman Clarine Barton. We found the condition of the grounds, the building housing the rest rooms and storage room and the tennis courts appalling. This was an unacceptable blight in our community. How do we move forward and change this to an asset? I felt depressed and tearful. But then, Councilwoman Barton whispered, "We can change this." She encouraged me to attend the next town council meeting and plead my case. With hard work and help from many hands, the wheels began to turn toward change. Mayor Johnston, County Councilman Willie Davis, the Loud Leadership Program, Dorchester School District #4 and the St George Rotary Club supported this effort to bring tennis back to St George. Soon the dream of introducing tennis to St George Middle School extended to the entire town. 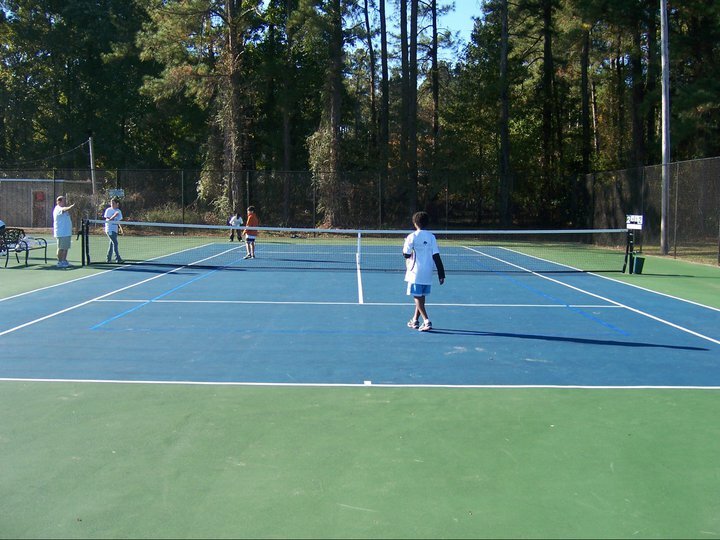 In April 2009 and 2010, the After School Program children enjoyed a professional tennis tournament at Family Circle Cup. Their excitement infected everyone that they shared the experience with. The area that I had cringed at two years ago is now a place of beauty. I invite you to visit the St George Tennis Courts. You will see children ages 6 years thru 18 years learning tennis from our Junior Team Tennis League volunteer coaches. This is our first season to have a USTA Jr. Team Tennis league. And now our young adults and seniors can have friendly tennis matches right in our own back yard. By the way, Dr. Butch Byron and Mr. Allen Brownlee demonstrated how proud they are of the new courts. They invited players from outside of St. George to come play on our courts. I can see a light at the end of the tunnel. But there is still more needed to complete the picture: benches for players to rest upon, a drinking fountain, a shade awning from the building for waiting players and the children who partake in the Summer Program, which we partnered with last year. Together, we have risen above it all. I can now truly say: "Some people see things as they are and say why? Others see things as they never were and say why not?"